Click the right arrow to begin the guide of viewing images on this website. 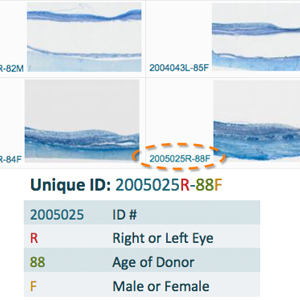 Each eye has a unique ID. The table on the right decodes the ID number. Each eye may contain the following images. All images are shown as Left eyes. 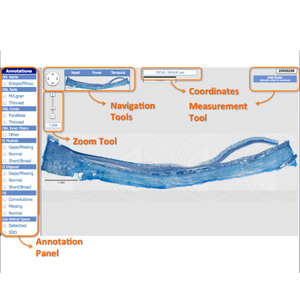 See User Guide --> Methods for Digital Section Preparation for more details. To zoom in or out on the image, use the highlighted zoom tool by clicking + for zoom in and - for zoom out. Alternatively, you can zoom in by double-clicking on the image. If you are using a tablet, the zoom tool may not appear. You can use the zooming method of your tablet. Use the mouse to click and drag the image in the desired direction. Use the arrow navigation tool. 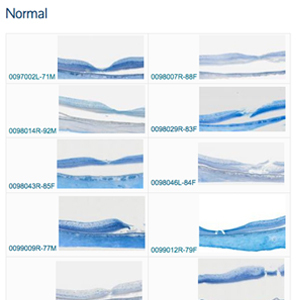 Select the scope of the image by clicking on the thumbnail image. 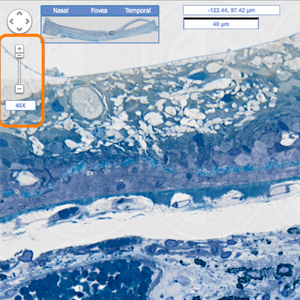 For quick navigation to key locations, click on the words Nasal, Fovea, or Temporal. 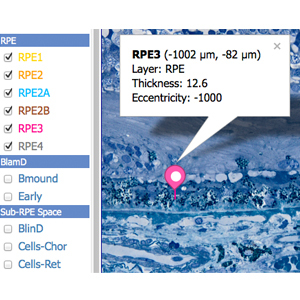 The annotation panel is an interactive tool organized by chorioretinal layer. 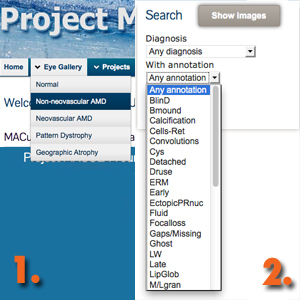 Click on the word to view a list of definitions and references. Click on the checkbox to view a marker on the image. Click on the marker on the image to view details including coordinates and layer thickness. 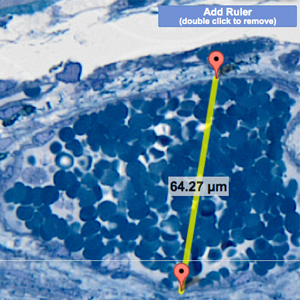 Click on Add Ruler button and an initial marker appears at the fovea. Click on that marker and a second marker appears. Drag markers to locations of interest. Double click the marker to remove them. 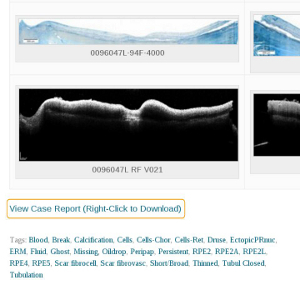 See high-resolution snapshots of key features of each eye in its Case Report. Click the right arrow to return to the beginning of the slideshow. 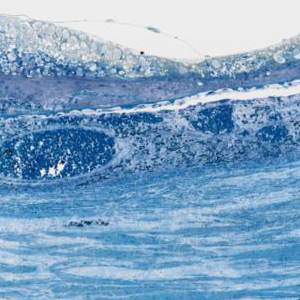 This website was conceived as histopathology resource for interpretation of clinical optical coherence tomography, an ophthalmologic diagnostic tool that is widely used for the management of age-related macular degeneration and other chorioretinal diseases. 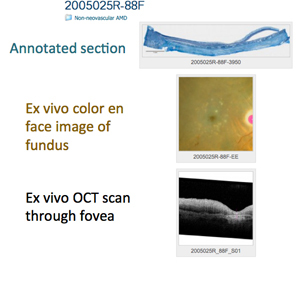 An annotated collection of eyes at different stages of AMD pathology, from aged to late AMD. 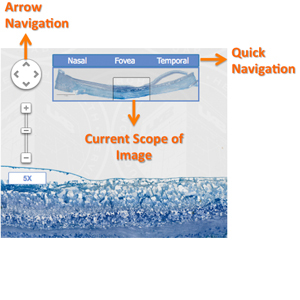 Macula-wide high-resolution sections through the fovea can be readily viewed with a Google map interface. 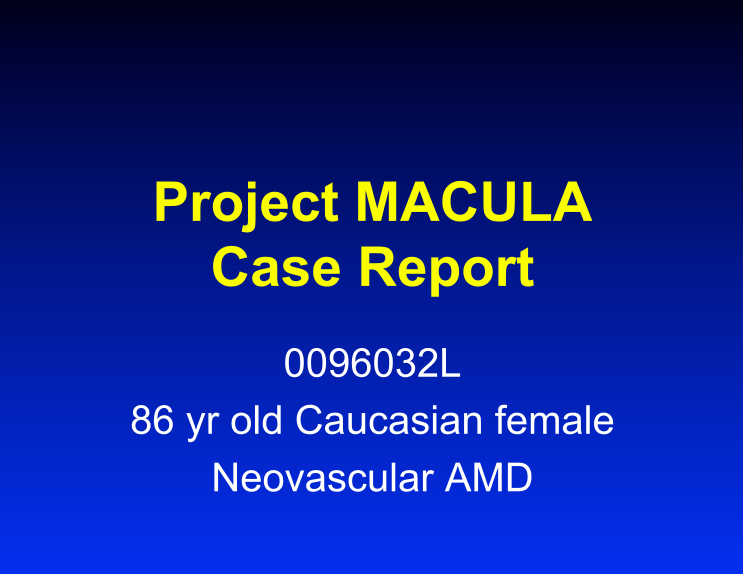 Forthcoming: 1000 maculas, with ex vivo imaging (color and spectral domain optical coherence tomography).